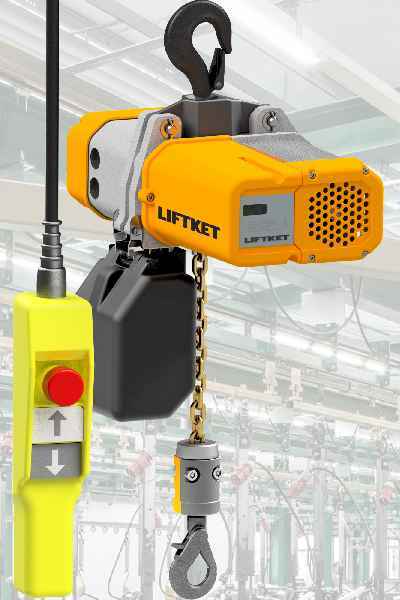 Liftket has developed the first electronically controlled chain hoist with quick stop function. The Star VFD stops without ramp-down immediately after the control button is released. Therefore, loads can be lifted or lowered to the desired level in one go. 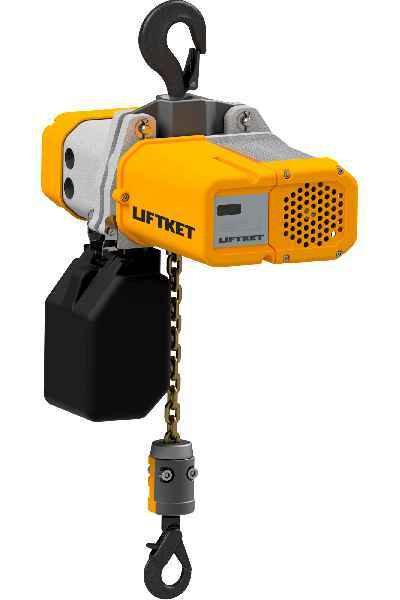 Liftket has developed the first electronically controlled chain hoist with quick stop function. The Star VFD stops without ramp-down immediately after the control button is released. Therefore, loads can be lifted or lowered to the desired level in one go. No longer is there a need for time-consuming stop-and-go, which today still is a common way to position loads with increased precision. The new series comprises hoists for loads from 125 to 2000 kg. With nominal speeds up to 36 m/min depending on the load, these chain hoists are much faster than comparable products on the market. Moving with no load, they can even be operated with up to 200 % of the nominal speed. This also saves a lot of time in everyday operation, since typically half of all runs are empty runs. And even apart from that, hoists are mostly operated with partial load. The speed of a Star VFD can be increased accordingly when the nominal speed is not fully utilized. This standard series provides customers with cost-efficient, fast hoists for heavy use and large-volume applications. Liftket ships individually configured chain hoists within 15 working days. The variable-frequency drive was specifically designed for this application in cooperation with a renowned international drive manufacturer. It is suitable for worldwide use. All hoist components are manufactured and fully tested at Liftket’s German headquarters. An online configurator on the Liftket website leads to a tailor-made electric chain hoist in just a few steps. The straightforward tool instantly generates complete documentation with technical drawings. Customers as well as unregistered users can access this service and export the data as a PDF file. An online configurator on the Liftket website leads to a tailor-made electric chain hoist in just a few steps. The straightforward tool instantly generates complete documentation with technical drawings. Customers as well as unregistered users can access this service and export the data as a PDF file. They can also request a quote, which will be emailed to them within minutes. They can place orders or a sales request referencing the quotation number. This unique ID enables sales staff to automatically access all configuration data, which helps to avoid errors. 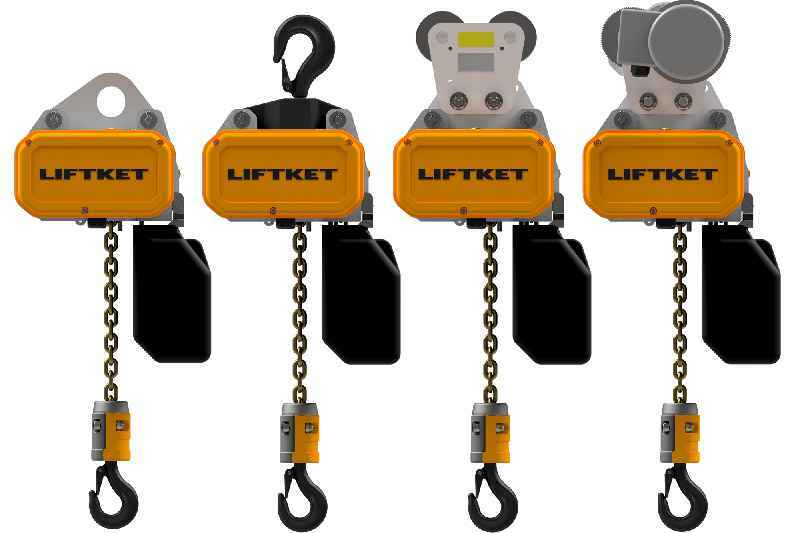 The configurator integrates all Liftket series. Various parameters can be freely defined or selected from standard measures: working load, lifting height, lifting speed, power supply specifications, type of suspension, and, if applicable, trolley type, trolley speed, and flange profile and width. This tool makes order placement for Liftket customers much faster and easier to handle in comparison to manually filling out conventional order forms. Managing and filing quotations is also greatly simplified. In addition, users can easily share quotes with other departments such as engineering and procurement. New Star VFD electric chain hoists with load-dependent, infinitely variable speed control from 2 to 36 m/min are now available from Liftket. In some applications, even speeds up to 48 m/min are possible. Moving with no load, the hoists can be operated with up to 200 % of the nominal speed, much faster than established products. LIFTKET Hoffmann GmbH has acquired all shares in ChainMaster Bühnentechnik GmbH effective on 1 August 2018. LIFTKET, a leading manufacturer of electric chain hoists, has been supplying ChainMaster for over 20 years. This event and stage technology specialist develops automated hoist systems including control, software, and operator interfaces. LIFTKET Hoffmann GmbH has acquired all shares in ChainMaster Bühnentechnik GmbH effective on 1 August 2018. LIFTKET, a leading manufacturer of electric chain hoists, has been supplying ChainMaster for over 20 years. This event and stage technology specialist develops automated hoist systems including control, software, and operator interfaces. ChainMaster will continue operations as a separate company with its established ChainMaster brand and its facility in Eilenburg near Leipzig. Company founders Susanne Hartung and Frank-Rainer Hartung remain managing directors. LIFTKET CEO Jürgen Dlugi plans to grow the stage segment, benefiting customers and employees of both companies. Both ChainMaster and LIFTKET supply international markets and work with qualified local partners for customer service and sales. The companies enforce a rigorous quality and safety management. At ChainMaster as well as at LIFTKET, product development and services are closely guided by customer requirements. The two companies will continue to develop and manufacture hoists for precise and safe positioning of lighting and sound equipment and other loads. Both LIFTKET in Wurzen and ChainMaster in Eilenburg are located near the city of Leipzig, in the dynamic industrial region of Saxony. The excellent situation of the labor market for qualified professionals as well as good infrastructure provide optimal conditions for further growth.